Before your child begins the ‘formal’ part of learning to read, they need to be given the opportunity to explore the letters of the alphabet and hear the single sounds in ‘less formal’ situations. 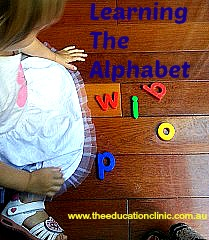 Exploring the letters and sounds is an important part to your child learning to read. Children need to be introduced to the alphabet and realise that though squiggles on the page mean something! This can all be done in a fun, playful way! Over the coming weeks I will share some ‘short and sharp’ ideas for exploring the letters and sounds of the alphabet at home or in the classroom. Allow your child to see a range of alphabet objects. This can help your child to explore the alphabet letters and sounds. Being exposed to the alphabet in a fun way can help them know that the alphabet exists and is an important part of reading. So what are some of the alphabet objects you can have available? By giving your child lots of different opportunities to see the letters of the alphabet and hear the sounds they make gives your child the best chance to recognize letters and their sounds.